Suggestion of Scene. A moorland of unspeakable desolation, near Forres, Scotland. The declining sun is obscured by thick clouds. There is but light enough to reveal the stretches of wet heather and a pool of dark water, with a clump of whins at its edge. The cross lightning splits the sky, and the thunder follows, peal on peal. Into this tumult of nature come three weird women, "in strange and wild apparell, resembling creatures of elder world." They come mysteriously from the air, as if born from the fury of the elements; they hold hands, and circle about in a strange dance, adding their unearthly, monotonous cries to the loud voices of the sky. Between volleys of thunder we hear them speak their short, abrupt lines. No sooner is the word "Macbeth" pronounced than the long-drawn cry of a cat is heard across the moorland; the first witch waves her hand, and cries, "I come, Graymalkin." The frogs call in their quavering voices from the distant bogs; "Paddock calls," says the second witch, thus signifying, like her sister, her connection with the invisible world. Again they circle, and utter in concert their ominous couplet; a peal of thunder follows, and the weird women are gone. Suggestion of Scene. A military camp near Forres. In the foreground at the left is the king's tent; before its entrance two spears are stuck into the ground, and at one side stands a rude chair. About the rest of the stage, the soldiers are seated on the ground in little groups, playing games. Others stand, talking earnestly together. They are clad in ancient Highland costume - the bonnet, the belted plaid, perhaps a short coat, the sporran, and stockings reaching above the calf of the leg, leaving the knee bare. An officer wearing a shirt of ring mail, and carrying a battle-ax over his shoulder, stands near the king's tent. A soldier, fully armed, paces to and fro on guard. The quiet of the scene is suddenly broken by the blare of a trumpet. The soldiers spring to their feet, seize their arms - battle-axes, spears, claymores, dirks, and small, round targets covered with bull's hide and studded with heavy nails. Loud words of command are heard; the soldiers form lines, as if expecting attack. The king, his sons Malcolm and Donalbain, accompanied by Lennox and others, come hurriedly out of the tent. Over his Highland costume the king wears a long robe; his gray hair hangs down over his shoulders. The alarm seems causeless, for there enter only four men, of Duncan's army, carrying a wounded sargeant, whom Malcolm at once recognizes, and who raises himself on his elbow, and with difficulty addresses his king. Weary of the long march, Banquo asks how far it is to Forres, but suddenly perceiving the weird women, puts his hand on his companion's shoulder, directs his attention to them, and asks, "What are these, etc.?" Macbeth has now met the strange creatures whose fatal influence over him has already begun. Suggestion of Scene. A cold and somewhat bare room in the castle at Forres. The rough stone walls are blackened with the smoke which rises from a reredos in the middle of the room. Near at hand sits the king in a great state chair, wearing robe and crown; about him, clad in their ancient Highland costumes, are his sons and other attendants. Suggestion of Scene. A great room in Macbeth's castle at Inverness. At the center in the rear is a great door in the thick, massive walls, opening into a hall that runs from left to right. After coming from this hallway and advancing a few paces, one must descend two steps to the main level of the room. To the right and rear, opening on the higher level of the room, is a small door leading to a passage; and farther forward, on the same side, is a larger door leading to Lady Macbeth's bed chamber. On the left, near the front, is a large door, approached by two steps. Over it hangs an antique lantern of iron work. High above is a small barred window. Suggestion of Scene. In the background the massive gate and walls of the castle at Inverness. Before it is a deep moat, spanned by the drawbridge, which has been let down by means of its heavy chains. The sound of hautboys is heard, and several mounted soldiers appear. They halt and await the king, who follows on horseback with his sons and thanes. These dismount and assist the king to descend from his horse. As the soldiers lead the animals away, Duncan talks a moment to Banquo; when Lady Macbeth, not the fierce spirit of the previous scene, but the sweet hostess, appears in the gate to welcome her unsuspecting guest. Suggestion of Scene. The same as Scene V. The room is but dimly lighted by a feeble flame in the antique lantern over the big door at the left. Through the wide portal at the back one sees attendants passing through the hall ; some carry torches, others play on hautboys; others, servants from the kitchen, carry great dishes loaded with viands, and flasks filled with wine. From the distant banquet hall come shouts of revelry, loud bursts of drunken laughter, and hoarse voices bawling snatches of songs. Suddenly heavy doors shut with a loud bang and the squeak of rusty hinges; the noise of the feast is shut out; the silence of death falls upon the room; the lamp flickers fitfully. In the door at the rear, Macbeth appears. He advances to the door at the left, which opens into a hall leading to the king's apartments. There he lingers doubtfully a moment, then turns back to the middle of the stage, where he speaks. Suggestion of Scene. The same as Scenes V and VII of Act I. Banquo and Fleance enter, the latter carrying a torch. The father rests his hand affectionately on the son's shoulder, and as they pause, looks up through the small barred window into the starless night sky. Suggestion of Scene. The same scene continues. Lady Macbeth enters through the great door at the rear. 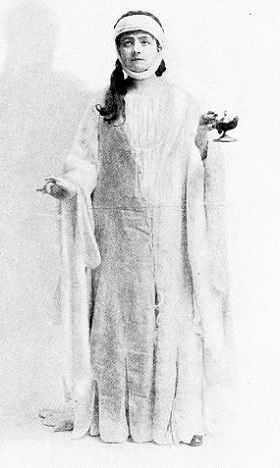 She is clad in white; her hair hangs in a flowing mass, and is bound about the forehead with a silver band. Some actors use lightning and thunder in this scene and the preceding, but this matter should not be overdone: some distant, ominous rumbling and a flash or two of fire in the small window high in the wall at the left may be effective, especially in the interval between Macbeth's exit and Lady Macbeth's entrance. As she comes toward the front, telling the effect the drink has had upon her, the hoot of an owl' is heard; she starts violently, but soon recovers herself. The scene is quiet, but the most intense excitement prevails. Suggestion of Scene. The previous scene continues. The guilty two disappear; the knocking continues. At the small door at the right and back appears the porter, staggering from sleepiness and drink; he yawns, stretches himself unsteadily, thereby running the risk of dropping the antique lantern he carries in one hand, and the bunch of great keys in the other. He takes a maudlin pleasure in imagining himself the porter of the gate of hell; at every knock from without he bows ironically to an imaginary arrival in that lower dismal region, announces the station of the unfortunate, and hints at the cause of his downfall. At the end, he goes out the gxc~t door at the center and rear, and turns to the left, and after a moment he ^s heard drawing bolts, dragging chains, and turning a key in a great lock. Then there is the tramp of feet and the sound of voices. Macduff and Lennox, followed by the sleepy porter, enter. Suggestion of Scene. In his book, "Shakespeare the Boy," Dr. Rolfe says, "It is not likely that he (Shakespeare) was ever in Scotland, and when he described the castle of Macbeth the picture in his mind's eye was doubtless Warwick or Kenilworth and more likely the former than the latter, for 'This castle has a pleasant seat,' etc." The quotation is from Scene VI of Act I; but we prefer to use the suggestion here rather than there, because it is more suitable here that the castle should be seen at a distance: in the former scene, Lady Macbeth meets the king, and she would not be likely to advance farther than the outer gate. Then, instead of Macbeth's stronghold at Inverness, fancy Warwick Castle, which, doubtless, Shakespeare saw many times when a boy. It stands by the Avon. At present a stone bridge spans the grass-grown hollow that was once the moat; but formerly there was no passage to the castle except the drawbridge, over which one passed to the barbican, a great square structure, with heavy battlemented towers, in which there are narrow slits of windows. Behind the barbican are the outer walls, and behind these, higher walls and higher towers; one called Caesar's Tower, from the old tradition that Caesar built it; another Guy's Tower, from the renowned Guy of Warwick. On each side of the barbican a few large trees relieve the coldness of the heavy masonry. Over all is the gloom of a day of ominous darkness. Suggestion of Scene. The Throne Room of the castle. The walls are wainscoted to the height of a man's head; above, the bare stone appears. At the rear, on a dais, are two royal chairs, and high over them is a canopy. On either side, against the wall, are the arms of Scotland. At the left is a table, on which are an inkhorn and quills, together with some parchment and a large open book. By the table is a high-backed, rude chair. Banquo is discovered standing with clasped hands, looking upon the throne, meditating. His words are interrupted by the sound of trumpets, after which Macbeth and his queen, in crowns and robes, enter, followed by the court. The royal pair seat themselves on the throne, and the attendants range themselves on either side. Suggestion of Scene. The same as the preceding. After Macbeth goes away, a servant enters, bearing the queen's robe of state; he stops, and bows as she enters. Suggestion of Scene. A lonely road in the forest. In the last "streaks of day" the mass of trees in the background appears dark and impenetrable, while in the foreground and the left is a road, which, in the center of the stage, turns toward the right and rear, and becomes lost in the gloom of the wood. As the two murderers skulk behind the trees, the third comes stealthily in from the left; and a moment later Banquo and Fleance, the latter carrying a torch, come down the forest road at the right. Suggestion of Scene. The scene is usually set thus: - In the rear the double-chaired throne. At right and left two long tables, one extending from near the throne, diagonally to the left and front of the stage; the other extending from near the throne, diagonally to the right and front of the stage. At the latter table, near the front, is the chair in which the ghost is supposed to appear. For a reason that will appear as the scene progresses, the following suggestion may be an improvement: - At the right and front of the stage stands the double-chaired throne, facing the left. A little farther back, occupying a large portion of the stage, is a long table set with bowls and dishes; here and there an ancient lamp flickers feebly. About the table are the chairs of the guests, and at each end a large chair with high back. At the left of the stage, near the end of the table, a fire burns on an open hearth. As the fire is lower than the level of the table, the top of the latter is in shadow, and particularly the opposite end is wrapt in a gloom that is emphasized by the feeble flames of the antique lamps. Shadows dance upon the stone walls, and help provide the weirdness so necessary to the scene. Several servants are in attendance. The royal procession enters; the king leads the queen to the throne, but himself remains among his guests. Suggestion of Scene. The same as the first scene of the play. The time, let us suppose, is night; and the moonshine streams through the dark fog that rises from the heath. At the end of the scene, Hecate mounts into the air, and vanishes. The witches, too, vanish thus, but in another direction. Suggestion of Scene. Suppose the scene to be within the castle gate, which is seen in the center and rear - a massive piece of masonry. A wide passage leads through the tower of which it is a part; at the farther end is seen the iron grating that protects the castle from sudden attack; through it are seen the road and the grass plot beyond. By the gate stands a soldier on guard, keenly observing Lennox and a lord conversing in low tones in the foreground. Suggestion of Scene. A cavern in the solid rock, whose strata are revealed in rough layers in walls and roof. From the crevices glistening drops of water creep, hang a moment, then trickle down or fall upon the wet floor, splashing themselves into spray. At the right stands a great cauldron, from beneath which green and blue flames dart upward, and seem to lick up the foam that overflows from the "hell-broth" boiling and bubbling within. A faint, uncanny light is thrown about the rocky chamber, the walls of which recede toward the rear and disappear in impenetrable blackness. Suddenly the three weird women appear, as if through the solid earth above, while a peal of thunder comes crashing down from the upper world. They pause about the cauldron, utter their short speeches, then begin their incantations, the first witch first, standing behind the cauldron and facing the audience. As she speaks, she takes, one by one, the hellish ingredients from a pouch, and drops them into the brew, from which a blue, yellow, or green flame spurts fiercely up. When she has finished, the three circle about the cauldron, stirring it with their long staves, and reciting the couplet in concert. Then the second witch has her turn, facing the audience like the first; then the third; the second again, and the charmed liquor is done. Macbeth enters from the left - enters boldly, and defiantly makes his demand. As the weird three reply, they point their long fingers at him, and renew, for a brief moment, their incantations. After which the three apparitions, announced by peals of thunder, rise in their turn out of the cauldron, utter their deceptive speeches, and vanish. When Macbeth demands further knowledge of his unhappy future, the cauldron suddenly sinks, a ghostly light appears in the background, and "eight kings, the last with a glass in his hand, Banquo's ghost following," appear one by one, slowly filing past. This done, Macbeth suddenly finds himself alone, and distressed at heart. Suggestion of Scene. A rough-walled room in an ancient castle. At the left a great bed, by which is a chair. In the middle of the room is a table with several chairs about it; upon the latter are thrown carelessly some articles of clothing - a woman's robes and a child's tartans. Lady Macduff, weeping and wringing her hands, sits by the table; her little son stands by her, trying in his childish way to give her comfort, while Ross stands near at hand, speaking and trying to control his emotion. Suggestion of Scene. The palace of Edward the Confessor stood in Westminster, where the Parliament buildings now stand. One portion of this palace was the old House of Lords, in the cellar of which was placed the gunpowder in the famous plot of Guy Fawkes. This room had long before been the kitchen of King Edward. The building was pulled down in 1823. The scene is before the great door of the palace. Two soldiers stand on guard. Malcolm and Macduff are seen descending the steps. They pause near the front of the stage, and the scene begins. Suggestion of Scene. Modjeska uses for this scene the same stage setting used in the murder of Duncan, and we follow her in this, ignoring, for the sake of effect, the fact that the murder was committed at Inverness rather than Dunsinane. The gaunt, bare room is obscured in the gloom of night. At the right the doctor and the gentlewoman talk in low tones until, in the great door at the back, the white-robed figure of the unhappy queen appears, when they move back into the deeper shadows. Lady Macbeth carries a taper, which illumines her face, making it the one bright object in the surrounding darkness. Her hair hangs loosely over her shoulders and down her back. Her eyes are open, but they have the steady, vacant stare of one who is asleep. Her face is ghastly white, drawn in lines of remorse and deadly fear. She pauses before she descends the two steps that lead down to the main level of the room, and seems to listen; true to the habit of persons in great terror, she holds her breath until she can hold it no longer, then expels it with force, and one knows that her heart is beating with the quickness of madness. All the while she rubs the hand that holds the candle, as if she would remove something from it. Slowly advancing, her heavy breathing continuing and her breast heaving, she approaches the stone table, sets the light upon it, stoops, and seems to dip up water from an "air-drawn" basin, and wash her hands. Then a groan of despair is heard, and there come, in a low, remorseful tone, the words, "Yet here's a spot." Suggestion of Scene. The open country, heather-grown and hilly. The Scottish soldiers, clad in their native war costumes (see Suggestion of Scene, Act I, Scene II) throng about their officers, and rend the air with their shouts when they learn that the English power is near. At the end of the scene, they hastily form ranks, and move forward at a swinging pace, singing as they go. Suggestion of Scene. As this act goes very rapidly, the frequent change of scene indicated in the stage directions is impracticable. Besides this, the matter of expense deters modern managers from making elaborate settings for so many scenes. Scenes III, V, VI, VII, and VIII (if they are all played) are, therefore, all counted as one, and this is usually represented as a terrace of Macbeth's castle - a broad space, with a tower rising at the right and rear, from which extends a battlemented wall to the extreme left. Beyond this may be seen the distant hills. Suggestion of Scene. The open country. A wooded hill in the right distance. The soldiers appear at the left, and march diagonally toward the right, shouting and singing. At Malcolm's command to hew down boughs to carry before them, they pause, cry out a loyal reply and march onward. Suggestion of Scene. The same as Scene III. Macbeth rushes in, shouting out his orders; within the tower is heard, for a moment, the preparation for battle; then silence, and "a cry of women." Suggestion of Scene. Before the castle - according to the stage direction. However, if the scene is played at all, the setting is the terrace of the castle, the same as in the case of several other scenes of the act. Suggestion of Scene. The terrace of the castle. Suggestion of Scene. The terrace of the castle. Macbeth rushes in holding his sword by the point, hilt down, and is about to fall upon it, when he changes his mind and concludes to fight further. On all sides are heard the shouts of victory. Shakespeare, William. Macbeth. Ed. Cyrus Lauron Hooper. Chicago: Ainsworth & company, 1902. Shakespeare Online. 30 Sept. 2011. < http://www.shakespeare-online.com/plays/macbeth/suggestionsstaging.html >.